Note: this was originally written and posted last winter. 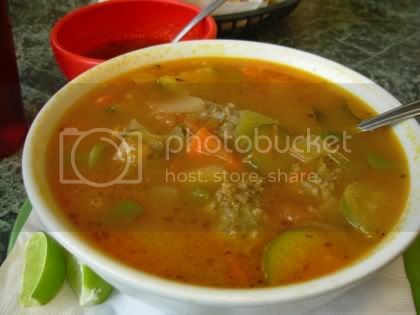 Not so appropriate for June, but still, a bowl of soup might be just what the doctor ordered. Before the sunny streak, this winter had been very much like the Shasta County winters Femme de Joie remembers from her childhood, when she had to walk five miles to school in a blizzard uphill both ways over hot burning coals -- whoops, sorry. That’s a different rant for a different time. But it looks like this season's rainy and cold winter has resumed, and that makes M. de Joie think fondly of soup -- not just adding one can water to one can of Campbell's, but real soup, soup that comforts you when you are sick, warms you down to your popsicle toes when you’re frozen, rejuvenates you when things look bleak. While it’s quite easy to whip up wonderful, soothing, full-meal soups in one’s own kitchen with only a modicum of effort, there are certain soups most people don’t attempt at home, putting them instead on the lists of foods they only eat when at a restaurant. And there are times when you just don’t feel like cooking, or when you need lunch but don't want to eat so much you feel groggy the rest of the day. If you’re out and about on a miserable winter day, or at home wishing you had a large steaming bowl of soupy comfort in front of you, here are a few of Femme de Joie’s favorites. Each is a meal by itself, reasonably priced, and most are just a bit more exotic than chicken noodle (though dear knows chicken noodle has its place on a list of favorite comfort foods). Albondigas, $4.50/$7.50, served with tortillas. This savory broth is seasoned with oregano and includes generous chunks of zucchini, carrots, onions and tomatoes, plus large meatballs. It’s sophisticated enough for adults while also appealing to kids. For the adventurous, Femme de Joie can't say enough good things about the ridiculously red giant bowl of menudo (not pictured) served daily at El Mariachi's. Hot tortillas and a side plate of lime wedges, dried chili flakes, minced onion and chopped cilantro allows the diner to enhance the soup to taste. Fat tender pillows of tripe -- without what a friend described as "that cow-stomach smell" -- bob in a rich chili base. $7.99 for an enormous serving; good whether you have a hangover or not. 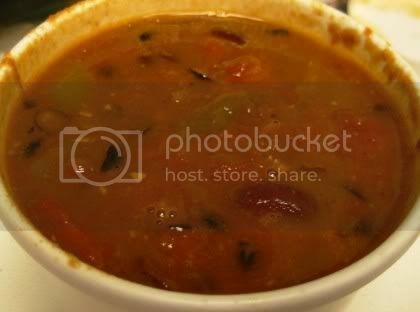 Every day, Grilla Bites offers a selection of soups -- mostly organic, always with a vegetarian selection, and some designated as gluten-free. The day M. de Joie visited, the offerings included vegetarian chili (pictured above), lentil, minestrone, and their signature Rockin’ Moroccan. $3.50 for a small bowl, $6.50 for a large serving; add $2.00 to be served in a bread bowl. 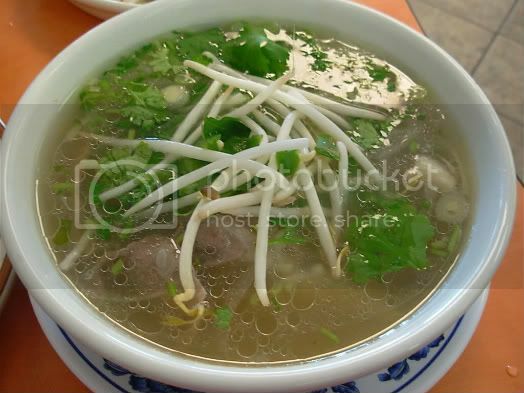 As the name indicates, pho is the specialty of this little cafe tucked away in a corner of a strip mall near Raley's. 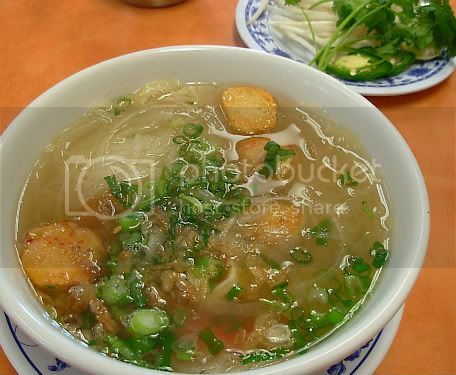 M. de Joie favors tai sach - variety beef cuts including tendon, tripe, meatballs, and flanken, along with rice noodles in a star anise-spiced roasted beef broth, side dish of bean sprouts, fresh cilantro, and hot chilis to add as desired. For those who like fish and want to expand their horizons a bit, try pho hai san - shrimp, squid, fish cake, imitation crab meat with rice noodle. A small bowl is $7.99. 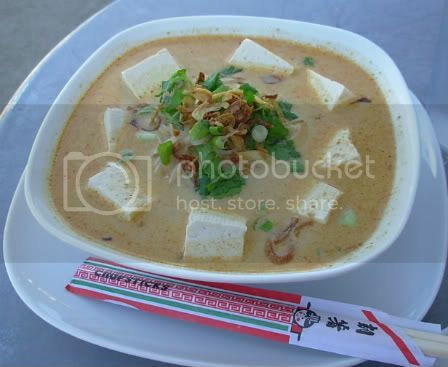 Khao soy ($6.99) may look like square marshmallows floating in a bowl of chocolate milk, but one sniff, one taste, will reveal flavor combinations of coconut, red and yellow Thai curry, and onion that are simply out of this world. If tofu doesn't rock your socks, chicken and beef are alternatives. Also available at sister restaurant Racha Noodle. If there’s a restaurant that makes a fine soup you crave, M. de Joie would love to hear about it. Meanwhile, give these places a try for a warming lunch or dinner that won’t break the bank. Call for opening days/hours and more information. Note: 5 Thais and Racha Noodle accept cash only.